The Dome Z-Wave Plus On/Off Plug-In Switch with Energy Monitoring device is not only an on/off smart switch, but also acts as a Z-Wave range extender and monitors energy consumption within your smart home. This smart switch monitors energy consumption and shuts down device in case of overload. The ergonomic design allows it to only occupy single side of electrical duplex leaving the second outlet fully accessible. Used to turn On/Off lamps and small appliances for up to 13 Amps (1,560 Watts). Operating Temperature: 32 degrees Farenheit to 112 degrees Farenheit. Requires a Z-Wave Certified Hub to operate. Square One, Ep. 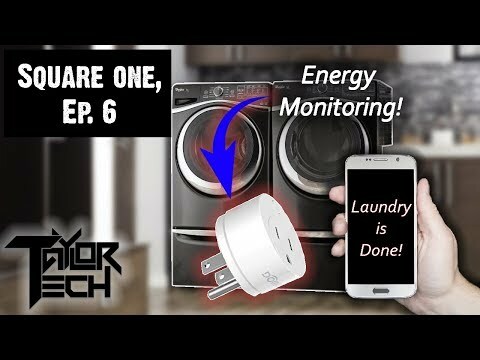 6: Laundry Alerts Using Dome Energy Monitoring Plug and WebCoRe!